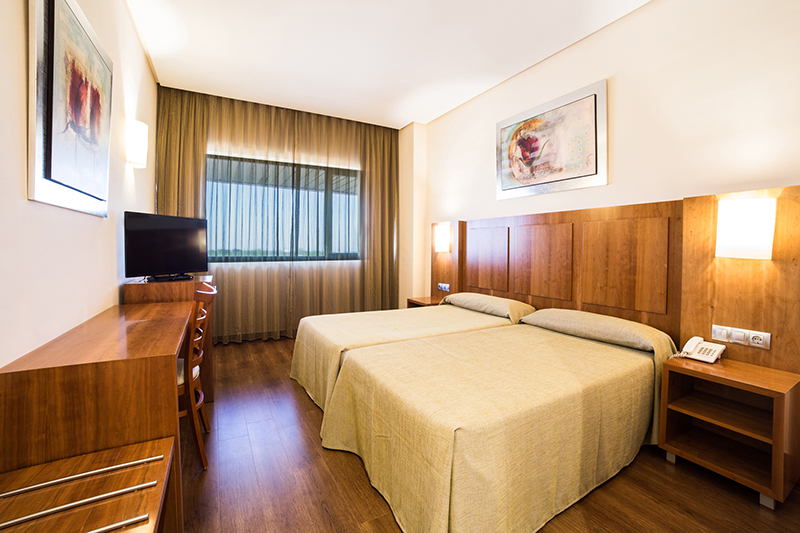 The new Leflet Sanlúcar Hotel is located in Sanlúcar la Mayor in the province of Seville, on the A-49 motorway and just 15 minutes from the centre of the city of Seville. It offers free parking and Wi-Fi connection. Next to our hotel there is a bus stop on the M-166 line, which connects to other towns in the region as well as going as far as Seville. The Leflet Sanlúcar Hotel’s 48 rooms are decorated in an elegant and modern style with plenty of natural light thanks to its large windows. They all have air conditioning (warm/cool), a safe, desk, flat-screen satellite TV, private bathroom with hair dryer, bathtub, bidet and complementary toiletries. The restaurant, Asador Los Norteños, with large patios, specialises in charcoal-grilled meat and you can even enjoy dishes such as suckling pig and lamb cooked in our stone oven. The hotel’s facilities include a café-bar which offers a breakfast and tapas menu, and you can choose whether to dine à la carte or enjoy one of our set meals, available from Monday to Friday for just €12. There is a fitness centre close to our hotel, which our guests can use for €5 per day. We also provide the daily newspapers for free and our reception is open 24 hours a day to advise and attend to our guests at all times. All the rooms have a Wi-Fi connection, a safe box, flat-screen TV, telephone, air conditioning, heating, bathtub and hair dryer. It is open every day except for Saturday and Sunday afternoons during July and August.